The “Big Band” wails swing music in the sybaritic art-deco Casino Ballroom in Avalon on Catalina Island. Dancers of all ages dressed in their ’40s finest triple-step, lindy, glide, and even perform aerials to the rhythmic, revved-up sounds of the Second World War. 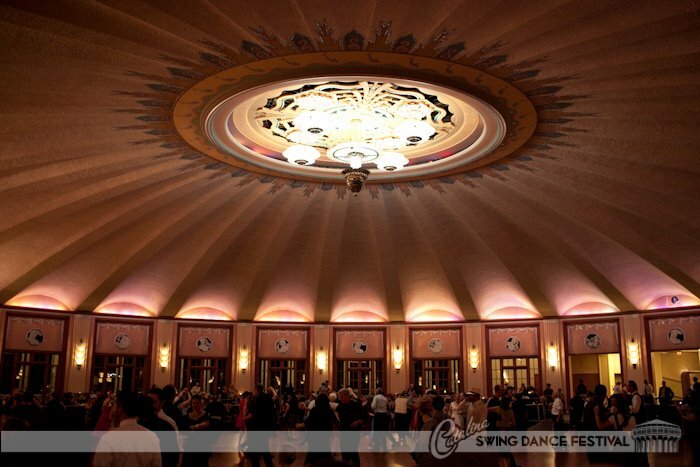 The Catalina Swing Dance Festival occurs annually in November (this year November 8-10.) During the day, a variety of classes are available including the Charleston, Lindy Hop, Collegiate Shag, 1950s Teen Swing, the Balboa, and more. 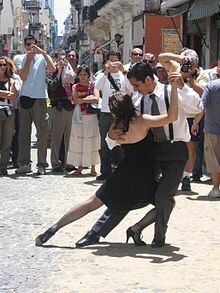 The Balboa dance uses small, close dance steps which were developed to cope with California’s Balboa Peninsula’s crowded dance floors in the 1920s. Instructors at the swing dance festival are enthusiastic, renowned professional performers and teachers. One needn’t have a dance partner to participate in the dance workshops or even be a dancer to enjoy this lively, nostalgic festival. On Saturday evening, even non-dancers can enjoy the live big bands and decked-out dancers in against the backdrop of the largest circular ballroom in the world. When it was built in 1929 it became the tallest building in Los Angeles. In it early heyday, thousands of dancers would arrive by steamship for the privilege and pleasure of dancing in the historic ballroom, which can accommodate over 6000 dancers! Built with dancers in mind, the ramps to the top floor ballroom facilitate relatively quick access to the dance floor and were also designed to prevent injuries or fatigue that could be caused by stairs. In addition, the hardwood floor was constructed over layers of foam, pine and cork, which are suspended over five feet. Besides the Casino Ballroom events, there is après-festival karaoke at El Galleon Restaurant, as well as midnight swing dancing at Antonio’s. In addition, there are both planned and spontaneous swing dance demonstrations on Crescent Avenue, the main tourist walkway. For people who wish only to make a day trip, there is typically a special 12:45 a.m. return ferry to Long Beach. Non-dancers and dancers can enjoy the island’s many land, air and water activities. Too numerous to mention them all, some of the land highlights include Wrigley Gardens, interior tours, golf, walking tours, bike rentals, and ghost tours. Scuba, snorkeling and “snuba” are available, which will require donning a wetsuit due to the cold water this time of year. Although the Descanso Beach Club, on one of precious few sandy beach spots on the island, is scheduled to be closed from mid-October until mid-April for low season, they sometimes open for out-of season warm weather weekends. They have cocktails, beach chair rentals, and snorkeling. For the adventurous, there is a nearby zip line eco tour. Information about Catalina Island activities is available at: www.catalinachamber.com/island/activities. The vibrantly painted Lobster Trap emphasizes fresh, tasty seafood in a casual and sometimes raucous atmosphere with friendly service at reasonable prices. Memorable appetizers include “monkey balls” (ahi-stuffed mushroom tempura), a variety of fresh fish with a choice of seven delectable sauces, as well as a good selection of chicken, beef and other land animals. A full bar, live weekend entertainment, and televised sporting events make this a fun and popular spot..
For a memorable lunch, head up to the Inn on Mt. Ada, the former Wrigley Mansion, perched atop a hill overlooking Avalon and its harbor. The highlight is spending several hours at the Inn with a lunch that includes unlimited beverages (wine, sodas, coffee and tea) and an extensive menu of salads, sandwiches, burgers, and the daily Mexican special. Even after finishing lunch, guests are free to roam the main floor of the Inn which houses the den, sun porch, living room, formal dining room, and the terrace, which reveals a spectacular view of Avalon, the harbor and beyond. 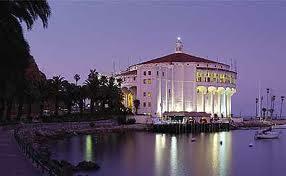 The Inn is the premier place to stay on Catalina. Reservations required. For a central hotel location with easy harbor and beach access, the newly-remodeled, mid-century style Pavilion Hotel is ideal for both couples and families. Amenities include continental breakfast, afternoon wine and cheese social, tranquil lounge areas, a cozy fire pit, and bright, airy rooms. The hotel is perfect for both families and couples. Luxurious accommodations are available at The Inn on Mt. Ada, but due to its location at the top of the hill, transportation is needed to get to the Inn and back to Avalon. Camping is another option for the adventurous or budget-minded. Book the hotel, festival and ferry early and pack as lightly as possible due to the necessity of carting luggage from the car to the ferry, the hotel and then back. Round-trip ferries on Catalina Express to Avalon leave from Long Beach, San Pedro, and Dana Point. The length of the boat ride depends on the route and type of boat, so carefully consider all options. The other transportation options are helicopter, or private plane which lands on the perilous-looking runway high on the island.